We are engaged in offering high strength Lube Oil Containers in the global markets. The Lube Oil Containers offered by us are made using optimum quality material providing reliable and high performance. 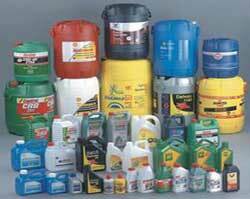 Besides, we provide Lube Oil Containers at market leading rates. Availability of view strip in blow moulding machines from Â¼ Ltr to 5 Ltr.